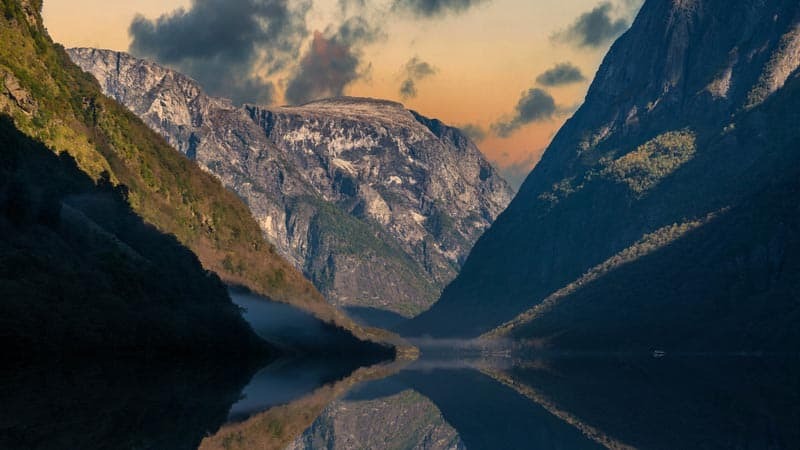 Norway is famous for its fjords, there's no doubt about it. But when you have limited time and funding, how do you choose where to go? 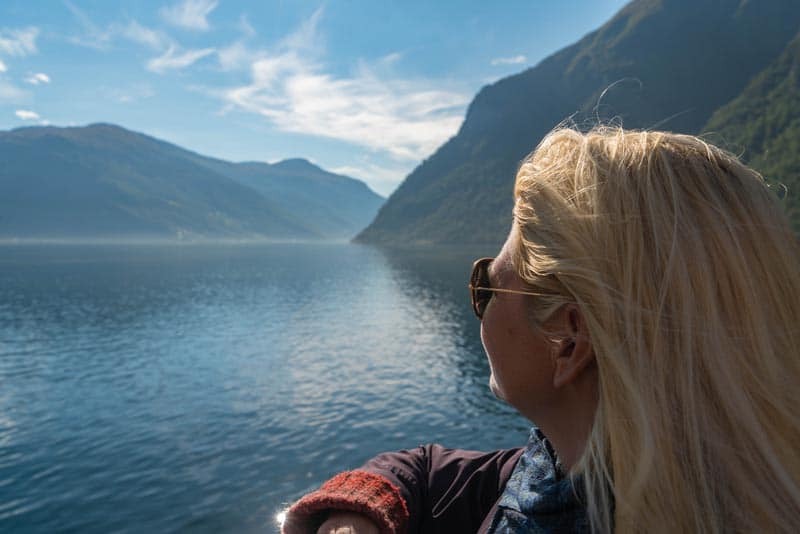 Our trip through Scandinavia with Go Ahead gave us the chance to explore the Norway in a Nutshell tour of the fjords, which offers a perfect way to sample the best of Norway's magnificent fjords while getting to see the capital cities of Scandinavia. We spent 14 glorious days traveling through Scandinavia by train, bus, and boat. I think the water portions of our Capitals and Fjords tour were my favourite. 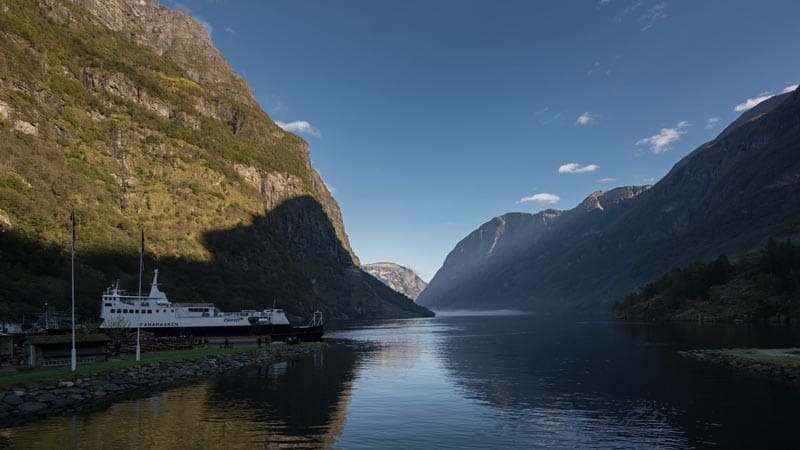 There is something calming and wonderful about floating through the fjords and channels while watching spectacular scenery from the deck of a ship. 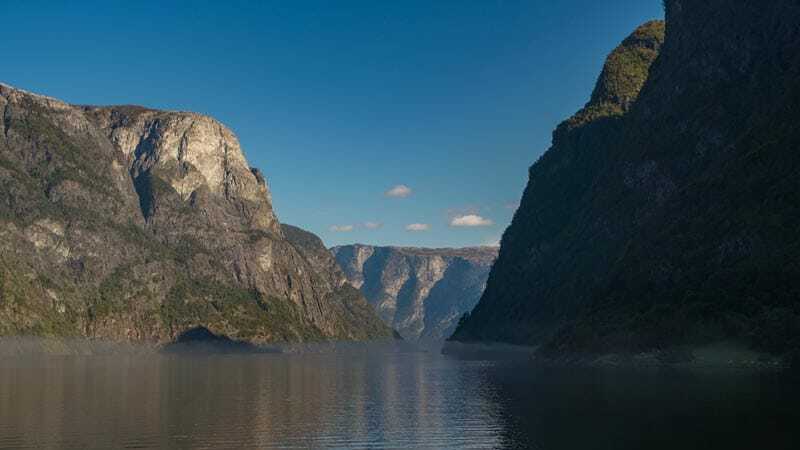 While we will definitely go back to explore more of the Fjords of Norway, I can relax knowing that I was exposed to one of Norway's most breathtaking fjords when we spent a day doing Norway in a Nutshell. 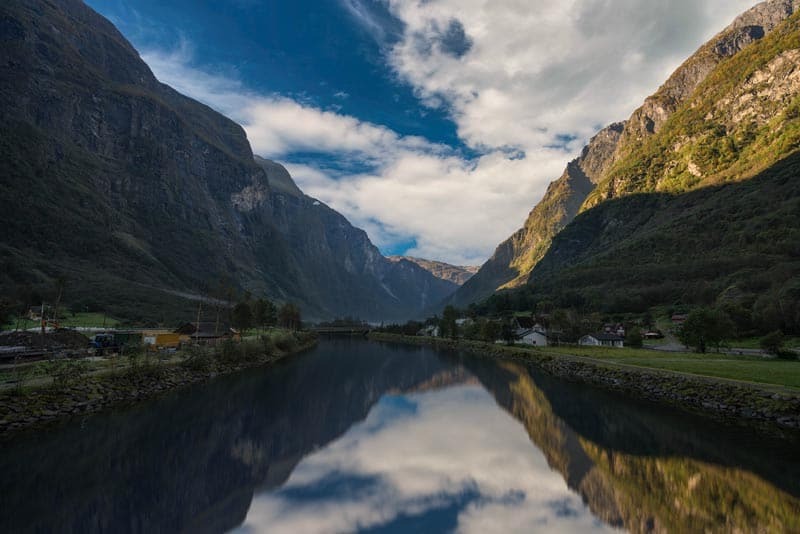 Norway in a Nutshell is probably the most popular tour in the country, which explores Sognefjord, the largest and best-known fjord of Norway. 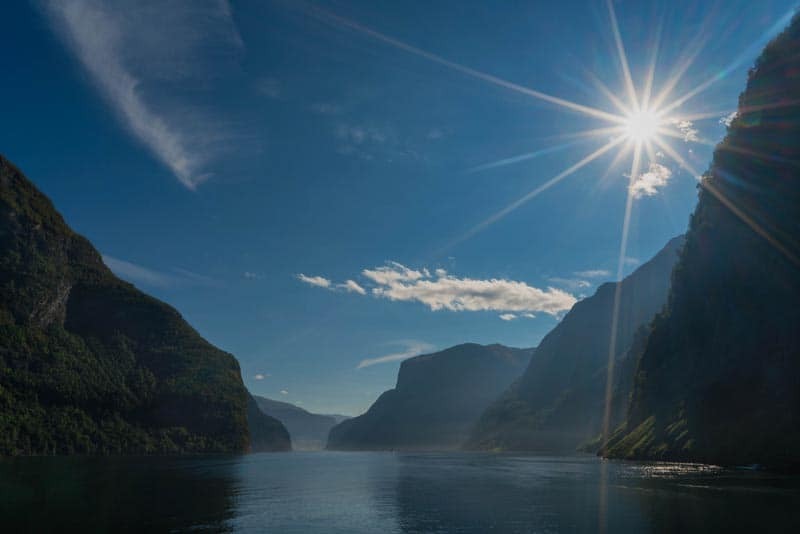 Stretching inland 205 km from the sea, it could take days to properly cruise and explore this spectacular fjord. We only had one day to see it, but our tour took us to the most beautiful portion of Sognefjord; the Nærøyfjord. 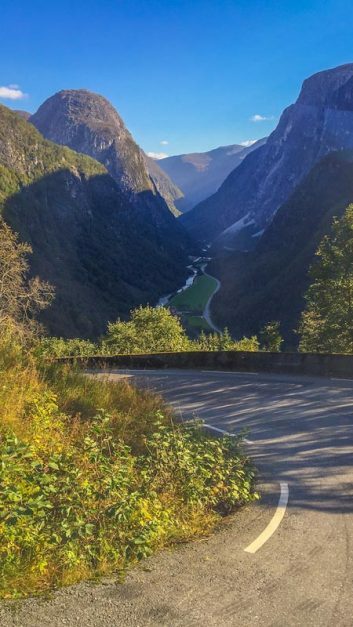 At only 20 km long, we cruised through this narrow arm of the Sognefjord surrounded by mountains reaching 1700 metres up to the sky. Starting in Bergen, Norway in a Nutshell is just that. 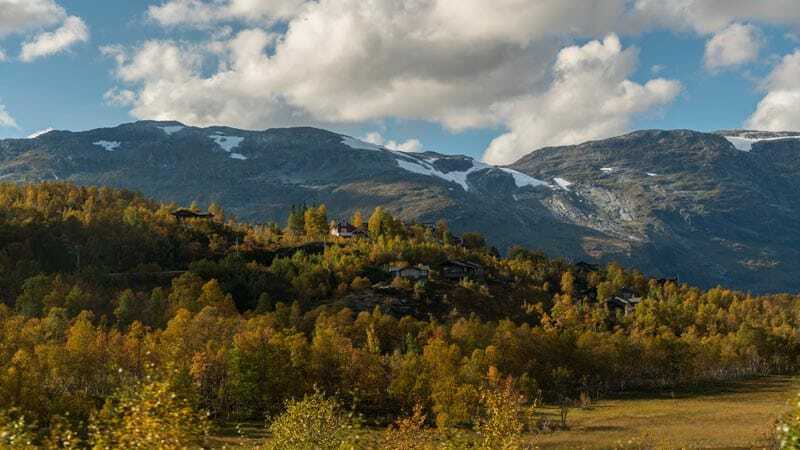 It gives you a taste of everything Norway has to offer, including stops in cities with views of mountains, lakes, a ride on historic and modern railways and of course a tour through Norway's fjords. Boarding an early morning train, we settled into a two-hour ride to Voss where we hopped on a bus taking us through a winding mountain road to the mouth of the fjord. I wasn't expecting such beauty, but the views from both the train and bus were magnificent. The bus drive was approximately an hour. The driver paused regularly on hairpin turns allowing passengers to snap photos of waterfalls and deep valleys below. By the time we got to the ferry, we were excited for the scenes ahead. If this is what the valley looked like, imagine what the cruise would be like! Our Ferry awaits at the mouth of the fjords. The amount of time we spent in Gudvangen was far too short. We could have spent the morning hiking and taking photographs of the scene before our eyes. However, there isn't a lot of tourist infrastructure here yet and only has a welcome centre, restaurant and small hotel, so we only had enough time to snap a few photographs before boarding our ferry to Flam. Everywhere you looked there were beautiful scenes like this. We were near the end of the crowd and felt the anxiety rising as we saw more and more people board the boat before us. Would we be stuck with a middle seat inside? It ended up that most people congregated on the back deck and didn't venture toward the front. Dave and I made our way quickly to the front of the boat where we settled into a front row view of the fjord cruise. I highly recommend staking your mark at the beginning of the trip and never moving. Once the ferry took off, people looked at us with envy as we had the perfect position – looking straight down the fjord. We couldn't have asked for a better day. Derek, our Go Ahead tour guide told us that he hadn't seen it this clear on a tour in five years. We felt privileged to have such luck! The walls seemed to tower above us. 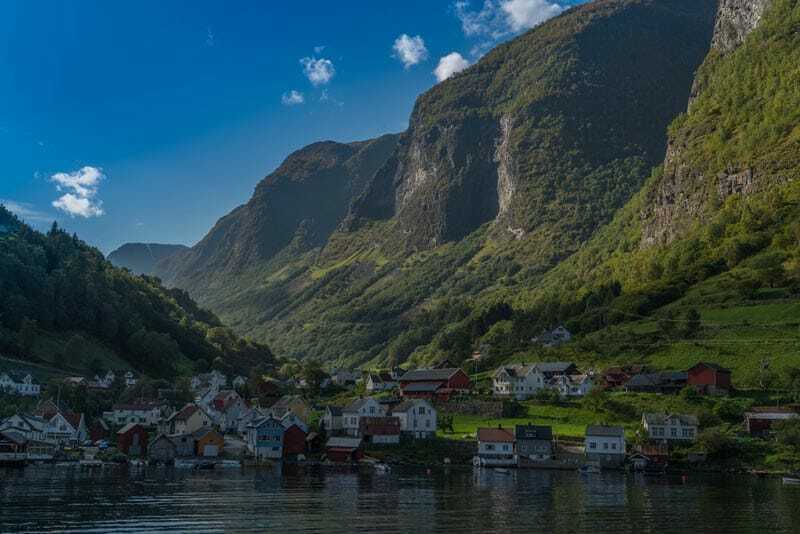 The cruise lasted for two hours weaving through the fjords as we slowly passed by small villages dotting the shores of this UNESCO World Heritage Site. We passed waterfalls and farms dating back to the Viking era where goats grazed in the long grassy fields. The wind can be brisk and when the sun goes in or behind one of the tall mountains, it can cool down quickly so be sure to pack an extra sweater and wind jacket. We felt completely comfortable, but we saw other passengers shivering. The cruise finished at the picturesque village of Flam. We only had about an hour to look around, but if you are traveling on your own, I highly recommend staying overnight here. 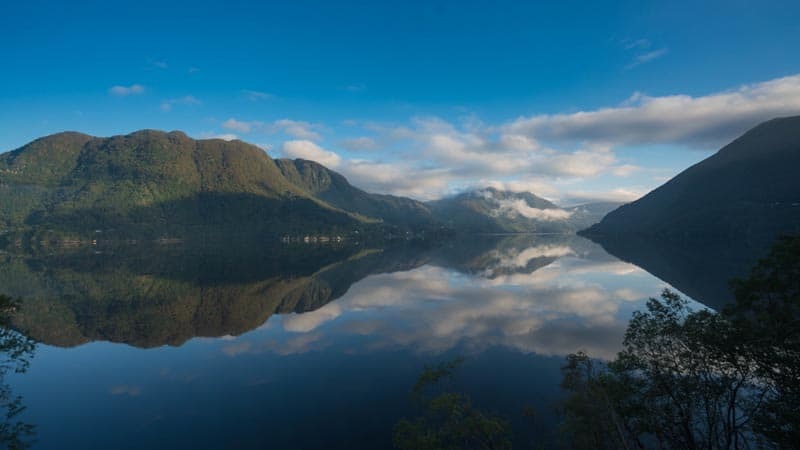 This town is located in the heart of the fjord filled with restaurants, shops, hotels, and a museum. But the true star of the village is the scenery. 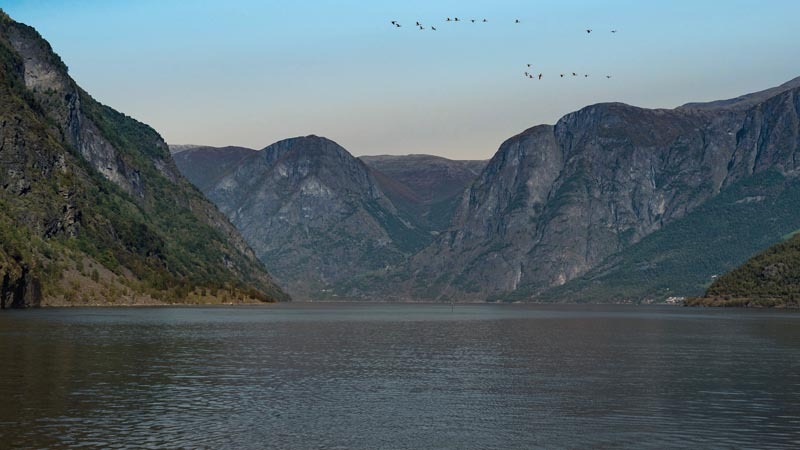 With fjords on one side and mountains on the other, it is the picture-perfect setting for a Norway getaway. 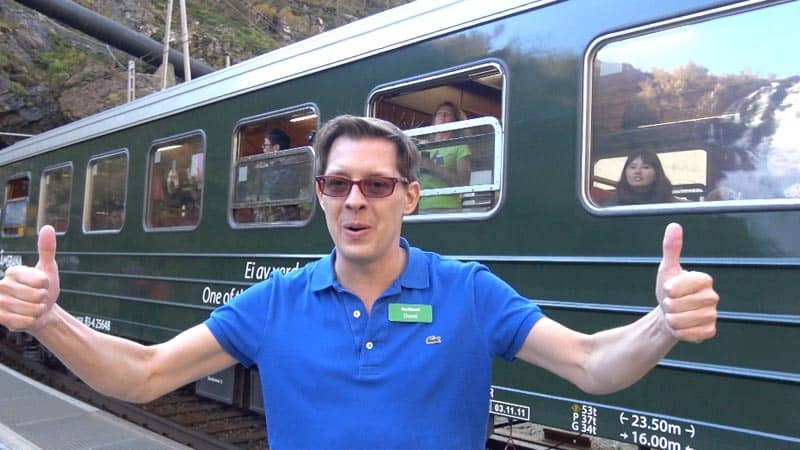 It is also here, from Flam, that we caught the Flam Railway to Myrdal. Starting at just 2 metres above sea level and rising to 866 metres in Myrdal, it is the steepest incline railway in Northern Europe. It is also one of the most picturesque train trips on earth. 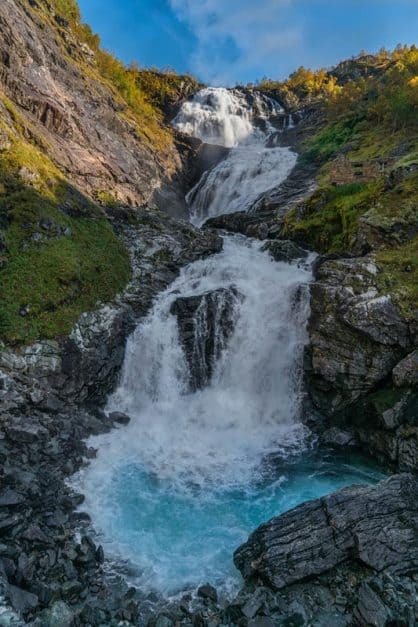 A highlight of our journey was the very quick, yet exciting stop at the Kjosfossen Waterfall. You have exactly five minutes to take photographs and the obligatory selfie before being herded back onto the train. Derek warned us that it was short and suggested we run to the viewing platform. I am so glad we did. We managed to snap plenty of photographs before anyone else from the train arrived. We took in the power and the beauty and were back on board feeling satisfied with our score. – Just another perk to having an experienced guide along for the ride. The final leg of our Norway in a Nutshell tour ended with another rail journey back to Bergen where we caught the sun setting over lakes and mountains as we sat in comfort in the passenger compartment. We were back in Bergen in time for dinner with visions of rolling mountains dancing in our heads. 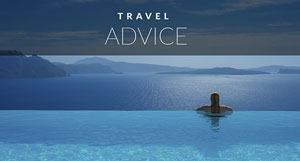 This post is in partnership with Go Ahead Tours who sponsored our trip to Scandinavia. As usual, all our opinions are our own. 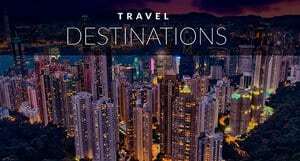 With more than 150 guided tours across all 7 continents, Go Ahead Tours has dedicated travel sites for both U.S. and Canadian travellers. 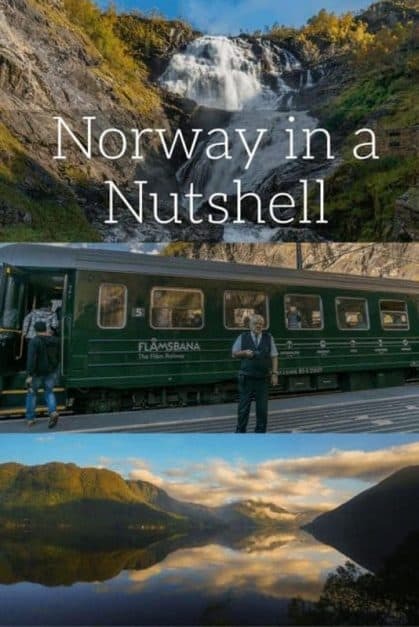 71 Responses to "Norway in a Nutshell – Scenic Train Rides to Fantastic Fjords"
Norway its a beautiful place, i hope i can visit some day! Indisputably beautiful! 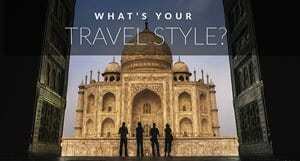 They are travel destinations that not only amuse, but add knowledge as well. Those places are so wonderfull!! These photos are simply fantastic, I bet that riding a train through these mountains should be very tasty and fun. OH my God, this place is amazing! Be aware not all “Norway in a Nutshell” are guided. We had prebooked our tour which left from Bergen. Arrived at train station expecting a guide only to be told it is self guiding. After some confusion we found the right train to board as there was no indication of which train to board. Found some busses waiting for us to take us to the boat. After some confusion we found the right boat to board. Cruise was great. Arrived to board Flam train. And luckily, after asking a staff member discovered if we did not get on the next flam train we would be stuck there as it was the final one for the day. We were stuffed into the train only to be sitting on the wrong side as we could not see the gorge on our side. To add to it all an employee had sat on the scenic side, taking up a double seat, and promptly had fallen asleep!! Expensive tour, was disappointed and stressed. Had come from Australia to see this area specifically. So be aware of what you book. what a fantastic place, consuming dream to visit this place! I’m planning a trip to Norway this summer! This is all so beautiful. We drove from Bergen to Trondheim exploring numerous fjords and hiked Mt Saksa. Geiranger fjord was beautiful, and it was shoulder season, so not a lot of tourists around (and hard to find services, luckily we had accommodations all pre-booked). This website is very nice. Beautiful pictures! Looks wonderful! i’d like to go there soon! Nice place, I want to go and live there. What a beautiful place, I hope to meet places like this one day. The world is beautiful. In a life you can not explore everything. But let’s do our best to enjoy it while we can. This website is very good. The pictures are beautiful. This website is very good. The pictures are beautiful. Congratulations! i’d like to go there one day!! I really enjoyed your post, Dave and Deb, as it brought back fond memories of my short visit to Norway a few years ago. 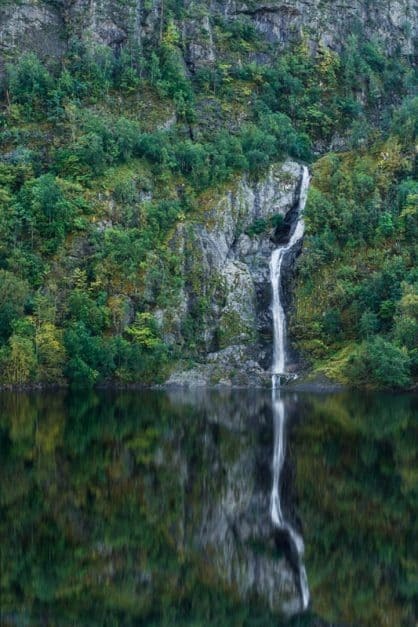 We did the Norway in a Nutshell tour as independent travelers and opted to stay overnight in Flam. I’m really glad we did as it was nice to explore the village after all the day trippers had left! 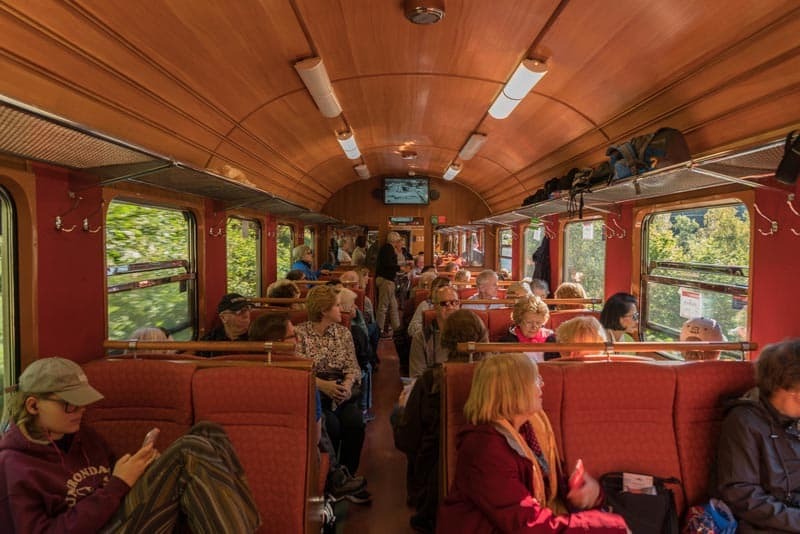 We enjoyed the ride on the Flam Railway, too. Beautiful photos! Norway is truly an amazing place! Thank you for sharing! What a lovely trip and your pictures are sooooo beautiful! Hopefully I can take a trip to Norway soon and experience all these! I love your photos, they are beautiful. I planned to visit Norway next year I loved blog .. I was in Norway last year. It’s a fantastic place! I was debating whether to attempt Norway’s fjords on my upcoming trip to Scandinavia. You just inspired a trip. Thanks for tipping my scales. My dream is to get to know Norway and I’m going to do this trip this year. Thank you for the tips! I am crazy to know Norway, even more after seeing these beautiful and lovely photos, I will program and next vacations I go to Norway with my fiancée. Guys, what a beautiful thing! 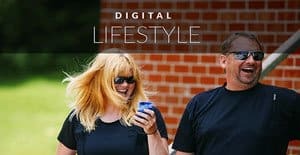 I loved the post, I loved the blog! Congratulations on the blog beautiful images. I’m getting married soon and have already scheduled my Honeymoon in Norway, this place should be really charming. Thank you for the beautiful photos. I agree, Norway is beautiful. I think this will be my next destination. I am big fan for photography. Thank you for sharing! Thanks! Norway was outstanding and very beautiful with a diverse landscape. Definitely worth visiting. I would love to visit any of these places, it must be something unforgettable. Stunning photos! 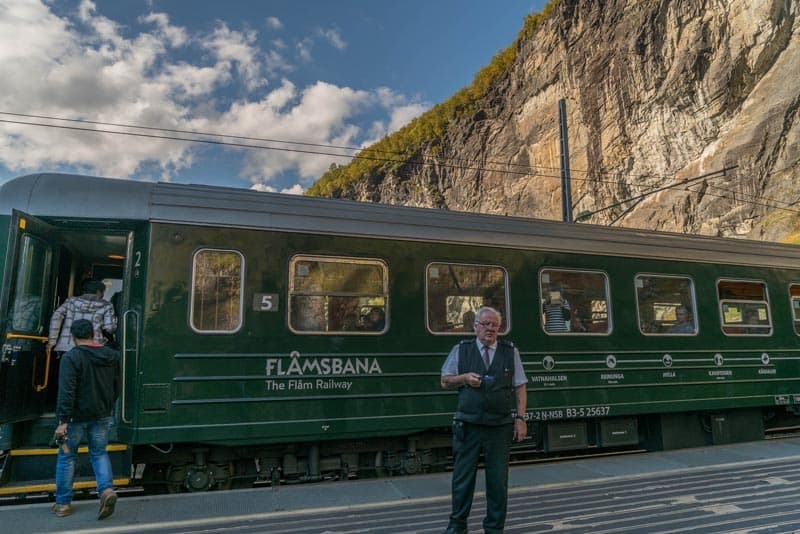 We have very recently returned from our first trip to Norway and took the train between Oslo and Bergen – described as one of the most beautiful train rides in the world. And my goodness, it was!! Highly recommend Norway to anyone – one of the most beautiful places I have been to. I’ve had the opportunity to get to know Norway for about two years. It is a fantastic and lovely place. Our photos are really amazing and wonderful, I need to know Norway urgently, what a stunning place. What a goldmine tourist idea in the Norway trip.Thanks for the idea and trip guide in the Norway Travellers.Your all picture are mindblowing and asome.Thanks For this. Thanks for a nicely introduce in Norway. I love your photos, so beautiful, so excited!. I planned visit Scandinavia with my friends from Nov, 25 to Dec, 10. Have any tips for the trip?